Finally an easy to use 2-stage snow blower - the Power Max HD 1432 OHXE 2-Stage Snow blower has many features to make your snow clearing job easy and yet is built tough to give you years of dependable performance. A breakthrough in snow blowing technology, the Power Max Anti-Clogging System (ACS) reroutes excess snow to prevent clogging and maximizes impeller speed and velocity. The patented Quick Stick control allows you to quickly and easily change chute direction and angle with 1 simple control. Power Max snow blowers are built tough with special hardened gearbox gears, designed to withstand the highest of stresses and resist wear unlike softer competitive gears in addition to a 1-piece frame for maximum strength while others use a 2-piece frame that has a weaker bolted joint in the middle of the machine. It has a 3-year limited warranty on the machine and engine and the chute, deflector and ACS are guaranteed for life. 420cc Toro premium OHV engine with 6 forward and 2 reverse speeds. Electric start - simply push the button and you're ready to go. Power steering provides effortless maneuverability. Quick stick 4-way chute - easily change the direction and angle of snow thrown. The double deflector allows for wider range of throw angles. Commercial grade auger gearbox designed to withstand the highest of stresses and resist wear. Durable steel construction in the housing, frame and chute. Anti-clogging system (ACS) - prevents clogging and maximizes impeller speed and velocity. 14 in. serrated auger powered by special hardened auger gearbox gears eliminates the need for shear pins. 16 in. tires for added traction. Also comes with cast iron skid shoes, 1" x 2" one piece handle, and drift cutters. This heavy duty Snow Beast Gas Snow Blower, powered by a 15-HP 120V electric start engine, transforms banks of snow into a clear path in a single pass. The 16-inch solid steel augers, along with a powerful engine, pulls in snow and discharges it up to 40 ft. away. Offering the best value in its class, you're sure to appreciate the convenience of this snow blower's 120V electric start, chute rotator, and six forward speeds. A must-have for landscapers, large lot owners, clubs, groundskeepers, and parks. Extension cord not included. 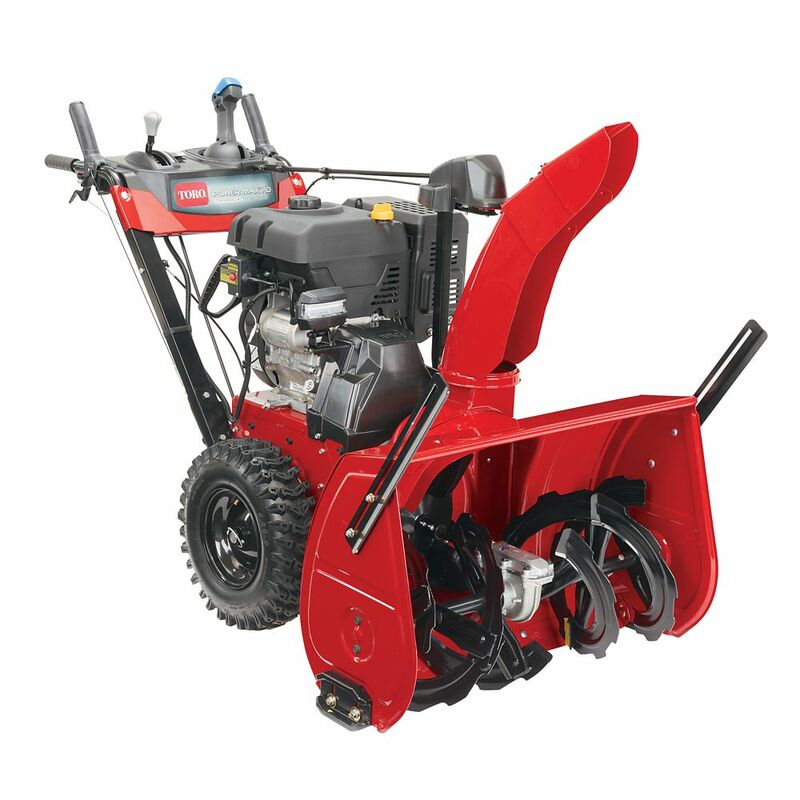 This 2-stage snow thrower is perfect for clearing larger driveways. Power through wet heavy snow easily thanks to the 272cc Columbia OHV engine. LED lights located on the dash offer improved visibility in low-light or snowy conditions. A three year limited warranty allows peace-of-mind while being backed by our Canadian Guarantee. Cut The Cord. Meet iON's big brother - iON Pro, an amped-up, deluxe-size version of the original battery-powered snow blower. The iON Pro 21-inch unit is ideal for clearing large driveways and walkways without the hassle of gas, oil, tune-ups, frustrating pull cords or tangled extension cords. An upgraded interchangeable and rechargeable 40V 5.0 Ah EcoSharp Pro Li-Ion battery, iON Pro delivers up to 65 min of whisper-quiet runtime on a single charge, so you can get larger snow jobs done without waking the neighbours or polluting the air with toxic emissions. This cordless dynamo is also engineered with a powerful 600W brushless motor for increased battery efficiency, optimal motor performance and extended motor life to keep iON Pro blowing strong season after season. iON Pro starts instantly with a simple push of a button and its adjustable handle maximizes user comfort during use. Equipped with a steel auger and 2 heavy duty rubber blades, iON Pro moves up to 660 lbs. of snow per minute, clearing a path 21-inch W x 8-inch D with each pass. Plus, the scraper bar at the base of the unit lets you clear right to the ground without any surface damage. Featuring a 1800 auto-rotate chute that rotates instantly with the push of a switch, iON Pro directs the snow stream up to 20 ft. away. Compared to heavier and more cumbersome gas machines, iON Pro weighs only 36 lbs., so you can easily manoeuvre it around your property. Power Max HD 1432 OHXE 32 in. 2-Stage Electric Start Gas Snow Blower Finally an easy to use 2-stage snow blower - the Power Max HD 1432 OHXE 2-Stage Snow blower has many features to make your snow clearing job easy and yet is built tough to give you years of dependable performance. A breakthrough in snow blowing technology, the Power Max Anti-Clogging System (ACS) reroutes excess snow to prevent clogging and maximizes impeller speed and velocity. The patented Quick Stick control allows you to quickly and easily change chute direction and angle with 1 simple control. Power Max snow blowers are built tough with special hardened gearbox gears, designed to withstand the highest of stresses and resist wear unlike softer competitive gears in addition to a 1-piece frame for maximum strength while others use a 2-piece frame that has a weaker bolted joint in the middle of the machine. It has a 3-year limited warranty on the machine and engine and the chute, deflector and ACS are guaranteed for life. Power Max HD 1432 OHXE 32 in. 2-Stage Electric Start Gas Snow Blower is rated 5.0 out of 5 by 2. Rated 5 out of 5 by Michael67 from Quality Snow Blower ! starts each time with one pull. Has electric start, but so easy to pull and start ! The quality craftsmanship that it shows in it is built to last a lifetime. Discharges the snow an easy 50+ feet away. Very pleased with my purchase.